Start with fresh, high-quality lamb for the best possible flavor. 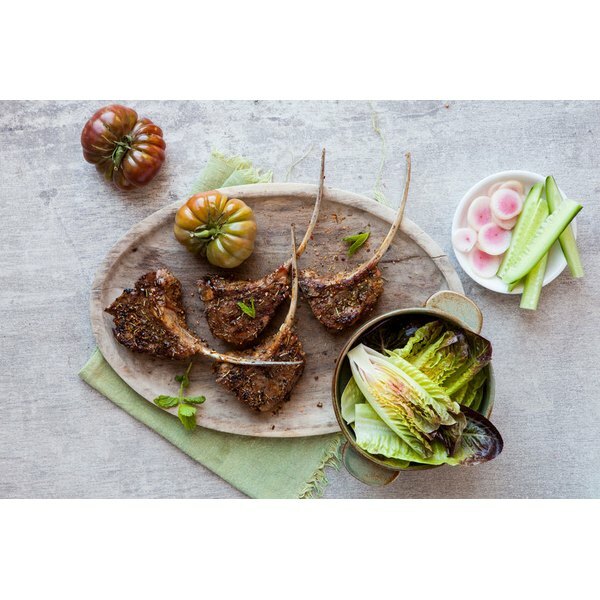 There are numerous ways to prepare rack of lamb, including broiling and baking, but grilling lamb intensifies the naturally rich, slightly gamey flavor of the meat, while thoroughly cooking the outside and leaving the inside moist and tender. Grilled rack of lamb can be served with homemade or store-bought mint jelly or a basic red wine sauce, and is often paired with roasted potatoes and carrots for a full meal. Serve simple grilled lamb with a robust red wine, such as cabernet sauvignon. Remove the rack of lamb from the refrigerator 90 minutes before you want to cook it to warm up to room temperature. Keep the meat covered with plastic wrap the whole time. Preheat a gas grill to 400 degrees Fahrenheit. If you are using a charcoal grill, preheat the grill for 20 minutes. Brush the rack of lamb with an even combination of extra virgin olive oil and melted unsalted butter. Season the rack of lamb all over with sea salt or kosher salt and coarse ground black pepper to taste. Place the rack of lamb on the hottest part of the grill and cook it for three minutes. Turn the rack of lamb over and cook it for an additional three minutes on the other side. Move the lamb to the edge of the grill with the thickest portion closest to the direct heat. Cook the lamb for 10 minutes on each side for rare meat, 15 minutes for medium. Remove the rack of lamb from the grill and transfer it to a large serving platter. Allow the lamb to rest at room temperature for 10 minutes before slicing and serving it so the natural juices can redistribute throughout the meat. Test the internal temperature with an instant-read thermometer if you prefer to be more precise. For rare meat, cook the lamb only to 120 degrees Fahrenheit. Cook it to 130 to 140 degrees Fahrenheit for medium. Avoid cooking lamb past the medium point, as it will lose much of its natural flavor and tenderness.